Do you wish you could add carriage garage doors in Bell Canyon CA to your home? Here’s some good news: you don’t have to sacrifice precious driveway space to accommodate the traditional swing-open style of carriage door. Instead, you can get a roll-up garage door with faux hinges, handles, and other details that will give you the look you want with the convenience of a modern garage door. At Carroll Garage Doors, we can help you achieve the custom look you want without breaking your budget. 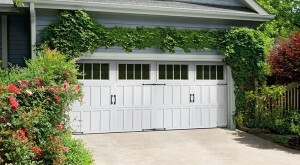 Your carriage garage doors in Bell Canyon CA won’t look or perform their best unless they are installed correctly. Fortunately, Carroll Garage Doors offers professional installation for all the doors we sell. We will not leave your property until our experienced technicians are satisfied that everything is working properly. This includes all the safety features of your garage door opener. We even offer 4 sided weatherstripping at no extra charge. In order to keep your carriage garage doors in Bell Canyon CA looking and working their best, you’re going to need repairs and maintenance. Fortunately, there is no task too big or too small for our talented technicians to handle. We do everything from garage door spring replacement to changing out garage door opener lightbulbs and replacing remote batteries. We even offer service contracts to make getting necessary maintenance a breeze. When you’re ready to shop for new carriage garage doors, or whenever your doors need repairs or maintenance, we are here for you. Just call 1-888-578-2360 . We are able to meet most needs in one day and your satisfaction is always our top priority.